The Milwaukee Curling Club (MCC), established in 1845, is the oldest continuous curling club in the United States. Curling, brought to the area by Scottish immigrants, was initially played on the Milwaukee River. James Murray served as the first president of the organization. Milwaukee curlers joined the Grand National Curling Club of America in 1867 and subsequently earned many accolades. In 1872, 1873, 1881, and 1885 Milwaukee curlers won the Grand National Gordon Champion Rink Medal. In 1884, the club won the international Gordon medal. Artificial ice’s invention contributed to the sport’s popularity in the 1930s, which saw a regional revival. Women’s curling began in Milwaukee in 1949, and mixed teams began shortly after. Bernie Roth, an MCC club member and the first president of the United States Women’s Curling Association (USWCA), hosted the first mixed bonspiel in 1951 through the MCC. Milwaukee hosted the World Curling Championships at the Milwaukee Exposition and Convention Center and Arena in 1989. The Milwaukee Curling Club is now located at the Ozaukee County fairgrounds in Cedarburg, where curling continues to be played. Curling organizations exist in Racine, Kettle Moraine, Wauwatosa, and Milwaukee. The 2016-2017 USWCA president, Carol Stevenson, is from the Kettle Moraine Curling Club. ^ Erika Janik, A Short History of Wisconsin (Madison, WI: Wisconsin Historical Society Press, 2010), 96-7; “About Us: The United States Women’s Curling Association (USWCA),” United States Women’s Curling Association, last accessed May 25, 2017; “History,” Milwaukee Curling Club, (2017) http://www.milwaukeecurlingclub.com/history.aspx, now available at https://milwaukeecurlingclub.com/historyPage.php?club=141, last accessed May 25, 2017. ^ Don McNeil, “The Circuit Reader,” Wisconsin Magazine of History 40, no. 1 (1956): 19. ^ “About Us: The USWCA,” United States Women’s Curling Association, last accessed May 25, 2017. ^ “History,” http://www.milwaukeecurlingclub.com/history.aspx, now available at now available at https://milwaukeecurlingclub.com/historyPage.php?club=141, last accessed May 25, 2017. Gidley, John M. Curling Superiority! 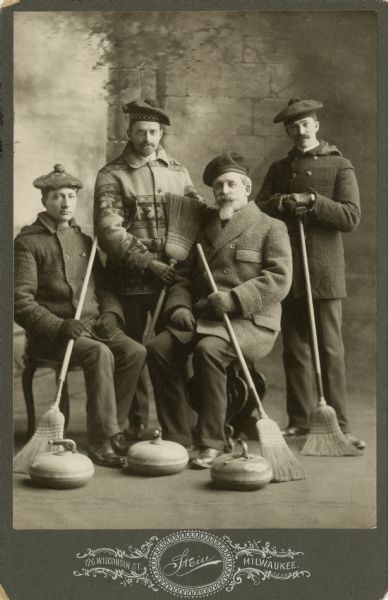 : A History of Superior Wisconsin’s Championship Curling. Superior, WI: Savage Press, 2000. Janik, Erika. A Short History of Wisconsin. Madison: Wisconsin Historical Society Press, 2010.